How Does a Corporation Pay Income Taxes? A corporation is separate from its owners (shareholders) in terms of income taxes. As a separate entity, the corporation's owners do not pay the taxes for the corporation. A corporation pays income tax by filing a corporate tax return on Form 1120 and paying the taxes as indicated by this return. Corporate income taxes are paid at the corporate income tax rate, not the personal tax rate. This article will give you a basic overview of a corporate income tax return and the information needed to complete this return, so you can find the information you need to include in your corporate income tax return. Should You Do Your Own Corporate Income Tax Return? You may decide that you want to do your own corporate tax return, or you may want a tax professional to do it for you. If you want to use an experienced tax preparer, this article can help you prepare documents and give you an understanding of the forms and schedules you'll need to give your tax person. Corporate income taxes are complicated. As you will see, there are many forms and schedules that must be completed - and all must be correct and complete. The major tax software program companies have corporate tax returns you can use. If, after you read through this article, you are overwhelmed, start looking for a tax preparer to help you with your business taxes. What is the Corporate Income Tax Rate? Effective with the 2018 tax year, the Tax Cuts and Jobs Act of 2017 decreased the top corporate tax rate to 21%. This means one rate for all corporate income tax returns; it is a permanent change. For 2018 corporate tax returns, a blended rate might need to be applied to your taxable income. If your corporation's tax year began before January 1, 2018, and it ended after December 31, 2017, you will need to figure and apportion your tax amount by blending the rates for 2017 and 2018. The IRS has a worksheet (on page 18) to help you with this calculation. When are Corporate Income Taxes Due? 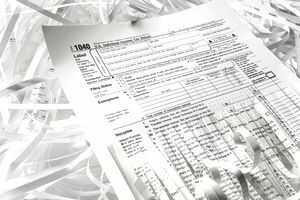 What is IRS Form 1120? Form 1120 - U.S. Corporation Income Tax Return is the form used to report corporate income taxes to the IRS. Form 1120 is also used to report income for other business entities that have elected to be taxed as a corporation (an LLC that has filed an election to be taxed as a corporation, for example). Form 1120 is not used to file an income tax return for a Subchapter S Corporation; this business type files its business tax return on Form 1120-S.
Before you take the form to your tax preparer, you will need to know the information required to complete this form. The information in this article is a general outline of this form to get you started gathering information to file your corporate income tax return. Not all details are included, and every business is unique, so be sure to review the Form 1120 to make sure you can answer all questions asked and provide all required information. Basic information about the corporation, including name, address, Employer ID (EIN), date of incorporation, and total assets. Your financial officers should have information about total assets; your corporate board secretary should have the rest of the information. Income by category, including gross receipts, cost of goods sold, dividends, interest, rents, royalties, and capital gains. Your corporate financial officer will have this information. Your financial officers should have all of this information. You don't need to provide documentation, but you must have complete documentation on these expenditures in case of an audit. Travel, meals and entertainment expenses. Be sure not to duplicate expenses you already included in cost of goods sold. Your corporation's financial officers should have this information. Again, be sure you have documentation. Taxable income, tax from a schedule, less any credits. If overpayment, refund amount. If underpayment, the amount owed. Schedules. Some are required (like the balance sheet), and others must be provided if the information is listed on the return. If you have a service business, you won't have the cost of goods sold, and you don't have to provide this schedule. Schedule L - Balance Sheet per books, at the beginning of the year and the end of the year (the beginning balance sheet should be the same as last year's ending balance sheet. Schedule M-1 Reconciliation of Income/Loss Per books with Income per return (this is a calculation your tax preparer will probably have to do. Schedule M-2 Analysis of un-appropriated retained earnings per books (another section your tax preparer will need to do). Deductions are the most complicated part of a corporate tax return. Most business expenses are tax-deductible as legitimate business expenses, but each deduction has limits and exclusions, and these change with laws and regulations. The best thing to do with business expenses is to list them all in full for the year. Then let your tax professional sort out what's really deductible and what isn't. If you would like more information about specific requirements and details about schedules, see IRS Form 1120 Instructions.